Purple lovers of all ages will go crazy for DeeDee Cuddles! Her beautiful teddy bear fur is so soft and is an amazing, vibrant shade of bright purple. 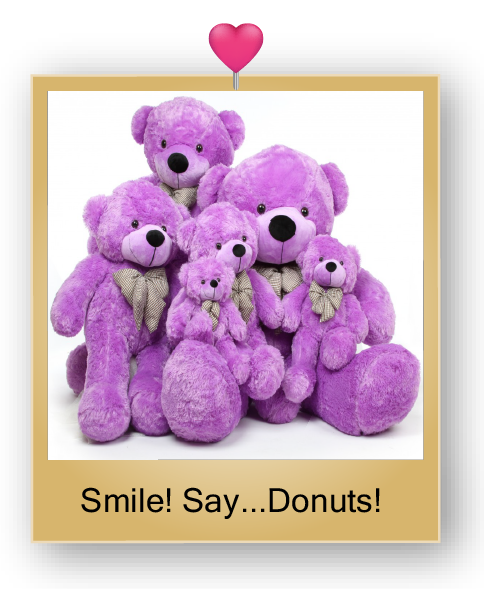 DeeDee is part of the Giant Teddy brand Cuddles Bear Family, with big brown eyes, a soft velvety black nose, and a wonderful smile on her teddy bear face. DeeDee has a cute brown and white checked scarf (detachable) and is one of the biggest, most huggable teddy bears you’ll ever meet. She makes a perfect gift for anyone, and is a special favorite for girls of all ages. Giant Teddy brand bears are all stuffed with love using new, lightweight, non-recycled materials that meet or exceed all US Safety standards. Our bears are safe for all ages, and each one passes our own Cute & Cuddly Hug Test before going on to their Forever Bear Homes.